Tickets for Royalton NYC New Years Eve 2020 are currently not on sale. 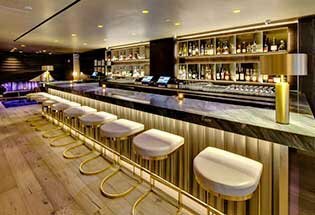 The Royalton Lounge, colloquially known as Forty Four, is located inside New York's lovely and posh Royalton Hotel from well-know hoteliers the Morgans Hotel Group. Proudly touting the Morgans name, both the Royalton Hotel and Lounge maintain the classy look and feel of the hotel group. 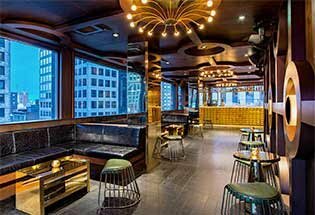 Located conveniently on West 44th Street just blocks from the famed Times Square, Forty Four boasts the three things any New Yorker always wants: location, space, and location! Forty Four is both a chic lounge as well as a popular bar and restaurant. On a regular basis, Forty Four offers a hotel lobby traditional happy hour with drinks galore and apps that will please any hotel patron's palate. World class bartenders serve elegant cocktails in a lobby that is equally elegant. 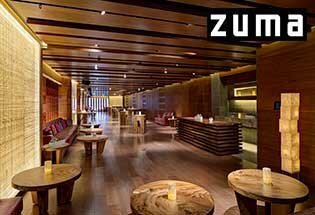 With neutral colored leather boothettes and couches in a spacious area, it is the perfect spot to unwind in style. From the relaxing atmosphere inside, you would never know the busting Times Square is just feet outside the door. Come celebrate your New Year's Eve this year with us at Forty Four. Rated the number 1 cash bar event, the Forty Four New Year's Eve bash is a sure bet to please. With tickets starting at just $35, you can't lose. A General admission ticket includes Admission to the event starting at 9 PM when the doors open. A live DJ will spin diverse festive hits all night long while you dance the night away into 2016! 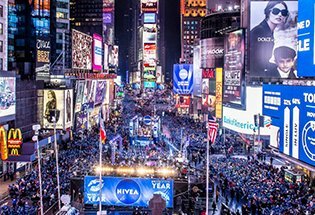 As the clock gets closer to midnight, a live New Year's Eve countdown will take place, amping you up for the first moments of 2016 even more. Festive party favors will be passed throughout the night to enhance your party spirit… and make your NYE photos just that much more fun! With a VIP ticket, you'll enjoy all the pleasure of a GA ticket… and more! Get the VIP treatment with reserved seating for the entire evening. You won't have to worry about losing your seat no matter how many times you get up! It will be there all night. So either way, don't miss out on and get your ticket to Forty Four's 2016 bash now! Dress to impress.